Marg (Maurine) Vanin, aged 87 years of Moose Jaw, SK passed away on Sunday, December 9th, 2018. Marg was born on July 8th, 1931 in Saskatoon, SK. She lived in Grand Forks, BC before moving to Penticton, BC to raise her own family. She was married to Walter Jay Vanin for 47 years before he passed away. 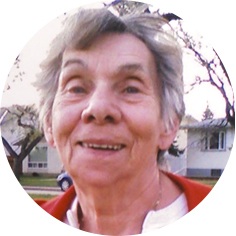 Marg found her passion working as a Dental Hygienist until the age of 72, and then took on the adventure of moving to Moose Jaw with her daughter and son-in-law in 2004. Marg had a zest for life and lived it to the fullest. She was always up for anything you threw her way. She just went with the flow. Marg loved the outdoors, especially fishing and she would quite often out fish the men! She had a passion for gardening and always had a helping hand for anyone who needed it, putting herself aside. She belonged to the Eagles Club as well as the CWL League. She was predeceased by her husband, Walter Vanin; and parents, Alex and Nelly Ozeroff. Marg is survived by her daughter, Jan (Marcel) Vermette; granddaughter, Laurie Ogden; grandson, Mike Vermette; great-grandson, Oliver Ogden who was the light of her life and loved hearing him call her Gg…Gg; and nieces, Jeniffer Jolly and Myra (Glen) from BC. The family would like to thank the staff at Extendicare for their support and ongoing care. In keeping with Marg’s wishes, a Private Family Service will be held in Penticton, BC where she will be laid to rest with her husband Walter. Arrangements are entrusted to Moose Jaw Funeral Home, 268 Mulberry Lane. Michelle Surtees Funeral Director 306-693-4550. Our sincere sympathy Jan and Laurie and Oliver, our thoughts and prayers are with you at this time. Cherish all those memories you had with her. God bless. Our sincere sympathy Jan, Laurie & Oliver, Our thoughts and prayers are with you at this time. Cherish all those wonderful memories. God bless. I was so sad to hear of your Mom’s passing Jan, she was such a kind soul. I loved having her for a neighbor, when we both lived at Park View Appartments, across from Cresent Park, always enjoyed our little chats back and forth, such a free spirit, she was! To you, Jan, Laurie and Oliver, a very special Mom and Grandma, I know you all we’re very close, cherish your happy fun memories, you had with her. Very sorry to hear of “cousin Marge’s” passing. She was a true friend and very dear to our Mom, Mabel Kondratoff. We will miss her as well. Our deepest sympathy. So sorry to hear of Marge’s passing. May the good times and memories help you all through this time of sorrow.